There are some common gins that have escape my careful eye over the years. And although I’m going to keep the focus on primarily gin innovation in America in 2012, I’m going to take an early year detour to Warrington, UK and look at a 250 year old gin: Greenall’s. I usually try to go easy on the history section because this is available on every other cocktail review site and the product’s own personal website. But Greenall’s has a couple of very interesting notes in its history. 1761 was the first year that gin making was legal in England. Hence that’s the year Greenall’s incorporated. In 2005 the Distillery experienced massive fire, which despite the scale of the fire, only shut down production for six days. Nice work! And finally, they’ve only had seven master distillers in two and a half centuries. (sounds like an impressive nearly 40 years per master!) The current master distiller Joanne Moore is one of a small (but rapidly growing) number of women master distillers around the world. It has a pleasing, but mild aroma. Its not particularly strong or intense. Neat, this bears out as well. There’s a bit more nuance. Intimations of classic flavoring elements like coriander, orange/lemon, and cassia hover just below the radar on the palate, ever so subtle. The juniper is easy going and very accessible. Its mild, and while the other flavors do a good job of not overpowering the juniper, they suffer from the fact that as co-stars to a very soft-spoken lead that they can easily get lost. Greenall’s doesn’t have a lot of heat for a London dry. It has a rather smooth quality that hovers somewhere between refreshing and leaving one wanting. There’s a certain substantialness that’s lacking and leaving me wanting. Its a London Dry style to the core, and the ingredients leave me wondering where that long finish or distinct spice is. Its not there, and that may actually be an positive for someone who wants a London Dry without feeling overwhelmed by the dryness. As I said, the flavors are subtle. If you want to taste the full range of Greenall’s, neat and dry martinis are the only place where I think it really shines. I found that even mixed in tonic the quinine was the dominant flavor. I had to really look for the juniper, and frankly nothing else stood out. It struggles when placed with bold flavors. It was hard to be tasted to in a Negroni, Aviation, Last Word or other similar cocktail. It was there, but very quiet. But perhaps this sounding too negative, because the smoothness and the subtlety can actually be a good thing, particularly with novice gin drinkers, or someone looking for more easy going cocktail. Its a perfectly acceptable gin for nearly anything you can throw at it. Best consumed: Smooth enough for a martini, but it works in about everything. Availability: Very common. Likely your corner liquor store. Rating: Non-gin drinkers may not know for certain that it’s gin upon first taste in a mixed drink. Solid gin with wide appeal that works well in any cocktail, but doesn’t stand out. Interestingly the recipe for the gin is the same as Bombay Dry, with the only difference being pot still maceration vs. vapor infusion. 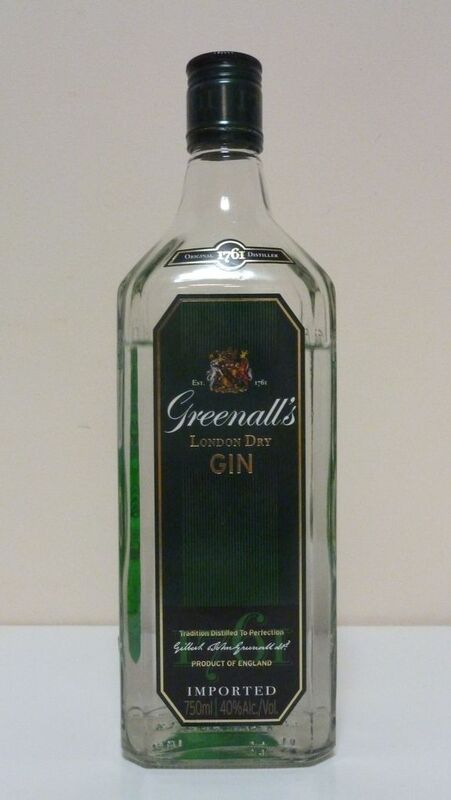 Both Bombay gins are also distilled by Greenall’s. I haven’t actually reviewed the classic Bombay. I was just talking to David (@summerfruitcup) yesterday and its a rather peculiar thing about UK gins, that several big names are actually made in the same places under many different names. While this happens in the US, its mostly with your local supermarket brands, not many of the big names. And yes! the bottle design! even weirder was that this was a rather recent shipment (12/2011). The liquor store I bought this at is one of my regulars and they’ve never stocked Greenall’s before! I’m wondering if either a) this was an old shipment or b) the American bottles have not changed. I would imagine that the bottles haven’t changed in the USA. I am not sure the nationalist celebration that its the union jack would be overly popular in the States, especially given that large parts of the USA seem to enjoy remembering independence and things like the Boston tea party. Greenall’s isn’t being pushed heavily by Total Wine here in Texas. I find it very ordinary. Ok for a G&T but never a martini. Total must have an ownership position. 2 stars at best. Sorry, meant is being pushed.